A group of men had come to Corinth, who presented themselves as apostles. They were, in Paul’s estimation, false teachers who were challenging Paul’s personal integrity, and his authority as an apostle. Paul made quick trip to Corinth to see whether he could remedy the situation. The visit turned out to be painful and did not accomplish its purpose. So when Paul returned to Ephesus, he wrote the Corinthians a severe letter “out of great distress and anguish of heart and with many tears” (2:4). That letter is probably lost to us. After trouble in Ephesus (see Ac 19:23–41), Paul set out for Macedonia by way of Troas. He expected to meet Titus in Troas to get news of the effect of his severe letter on the Corinthian church, but Titus was not there (see 2Co 2:12–13). Still deeply concerned and despite the fact that the Lord had opened up an opportunity to preach the gospel at Troas, Paul said goodbye to the believers there and moved on to Macedonia, where he met Titus. To his relief, the news from the Corinthian church was basically good. The severe letter had brought its intended results (7:5–16). The encouraging report of Titus of the improved situation at Corinth is the immediate occasion of the writing of 2 Corinthians. Not all the tensions were dealt with as we can see in chapters 10-13. As old as this quote is, we cannot get past its reality. You can’t judge a book by its cover, a movie by its trailer, or a person by their Facebook page. Yet, that doesn’t stop us from trying ourselves. We try to project the best image of ourselves for others to see. If we did judge everyone by their online appearance, we would conclude that most are happy, successful and confident! And this kind of thing isn’t only limited to the internet: it’s our clothes, the way we talk, the things we buy. We often craft our impression of that person accordingly. Yet, as we all know personally – things are not necessarily as they appear to be. Appearances can be deceiving. It’s out of this knowledge of reality that people long for what is authentic, what is real. We aspire to live genuine lives beyond appearances. Paul’s 2nd letter to the Corinthians has much to say about these matters. 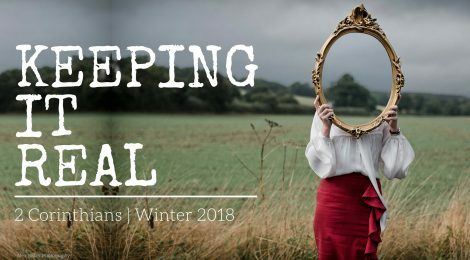 And over the course of the church season of LENT in 2018 we will be exploring some of the paradoxes of Christian living – eg, that our lives are more than they appear, and that God looks not to mere appearances, but to the heart and to relationships. May God shape us more and more by grace as we engage with this series of sermons and studies.